Lord I (former Potentate of Arcturus), barbarian queen, numerous unidentified barbarians (androids and baseline Arcturans); pink-skinned society. Traits: The Arcturans are divided across the planet into small civilizations, which include democracies, monarchies, and dictatorships. The population was divided among the mutants (nearly 50%), and tribes of barbarians composed of a mixture of normal/baseline Arcturans, and androids. Arcturans previously possessed an advanced interstellar fleet, but the technology was lost after the great war over 10,000 years ago. The sole surviving ship from that era was piloted to Earth by Lord I and crashed on Earth. At least one group of Arcturans had eventually re-mastered astronomy and the use of telescopes. (Fantastic Four I#316 (fb)) - A warp between Earth's Savage Land and the planet Arcturus IV was created under unrevealed circumstances, possibly by the Nuwali before the creation of the Fortisque (as speculated by Max). (Fantastic Four I#316 (fb) / Official Handbook of the Marvel Universe Update'89 #2: Comet Man entry / OHotMU 2006 A-Z#2) - The Fortisquians were created via genetic manipulation by the extradimensional entities known as the Beyonders. The Fortisque were based at a station orbiting the star Arcturus they served mainly as the Beyonders' colonizers throughout the galaxies, first upon the other planets in their star system (including Arcturus IV), and then they fanned out to other systems, including Earth's human race. (Fantastic Four I#316 (fb)) - Only a few Fortisquians were present on Arcturus or any other world, though they maintained a presence "everywhere." ((Adventure into) Fear#23 (fb)) - On Arcturus IV (possibly via the Fortisquian colonizers' guidance), science mastered the manipulation of heredity. (Fantastic Four I#316 (fb)) <18000 BC> - The Celestials bombed Deviant Lemuria and precipitated Great Cataclysm, including the Great Flood that wiped out most of civilization on Earth (apparently including the Fortisquian colonizers there). 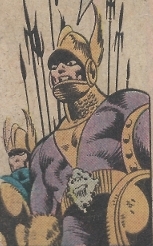 The Beyonders contacted the Fortisquians on Arcturus and directed them to save their animal preserve on Earth (the Savage Land, which had actually been created by the Nuwali for the Beyonders). ((Adventure into) Fear#23 (fb)) - After the Fortisquian colonizers departed for Earth, debate raged as to whether science should be employed toward perfecting the race. ((Adventure into) Fear#23 (fb)) - In time, the Arcturans decided they should perfect their race via science. The Incuflask factories came into being. It was decreed that children born of women would be destroyed, and all natural reproduction ceased. ((Adventure into) Fear#24 (fb) - BTS) - The Arcturan flask-spawned race creating a mighty stellar fleet and designed numerous androids. ((Adventure into) Fear#23 (fb) / Fantastic Four I#316 (fb)) - To many Arcturans, it seemed inherently wrong to take evolution out of nature's hands. They thought to reverse the trend, with terrorist means. They began bombing Incuflask installations, and shortly thereafter, full-scale war erupted. The Arcturans' nuclear weaponry, vastly more efficient than Earth's nuclear devices, destroyed most of society. Those who survived went mad, deserting the cities. They lived in tiny, primitive tribal enclaves. ((Adventures into) Fear#21 (fb) /Fantastic Four I#316 (fb)) - <8000 BC> - The Fortisquian colonizers from Arcturus IV, traveling to Earth via a ship known as the Comet, crashed on Earth under unrevealed circumstances. Three of the ship's personnel survived to become the Caretakers (the fourth survivor, his memory somewhat damaged, went on to become Daemond). The Caretakers explored the Savage Land and found a teleportation warp that returned them to Arcturus IV, which was in ruins. They found the return warp to Earth and set up a laboratory in the Savage Land. ((Adventure into) Fear#23 (fb)) - The tribal enclaves forgot the reasons for their current existence, and the ruins of the previous society were mysteries, temples for them. ((Adventure into) Fear#24 (fb) - BTS) - Arcturus IV was populated by a race of mutants and by tribes of android and human barbarians. (Starmasters#1 (fb) - BTS) <unspecified "millennia" ago> - At least one tribe of pink-skinned (presumptive) mutants studied astronomy. (Starmasters#1 (fb) - BTS) <500 years ago> - At least one tribe of pink-skinned (presumptive) mutants began using the telescope. ((Adventure into) Fear#24 (fb) - BTS) - Lord I became potentate of a city of mutants. ((Adventure into) Fear#24 (fb) - BTS) - Lord I found diagrams in his city on the layouts of the long ago-created starships. ((Adventure into) Fear#24) - The barbarians worshipped the remaining starships (or at least the last remaining starship) as god(s). ((Adventure into) Fear#22 - BTS) - Morbius accessed a portal to Arcturus IV from the waters around the Land Within (home of the Cat People). ((Adventure into) Fear#23) - On Arcturus IV, Morbius ambushed a couple as they held each other in a relaxed embrace in a forest. The warrior male fought back fiercely, but Morbius overpowered him and attempted to drink his blood, only to find him an android. He questioned the female and then assaulted her instead, finding her an organic being and only draining enough of her blood as he needed for the moment. Morbius wandered out of the wilderness and found the ruins of a city by dawn. Lord I then cast a mental projection to Morbius, introducing himself and guiding Morbius to the mutants' hidden base within the city's ruins. Revealing the Arcturans' history and explaining how the mutants, despite vast intellect and lifespans measured in centuries rather than years, had no instinct for self-preservation and actually desired death. Lord I asked Morbius to kill the Caretakers. 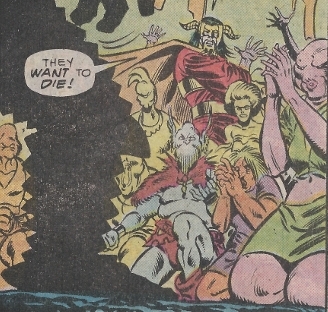 Overwhelmed by hunger, Morbius grabbed a mutant woman (who had flippers in place of hands) from their midst and fatally drained her of blood; when none of the Arcturans interfered (though Lord I shed a tear), Morbius realized he could not let the Caretakers do to Earth what their successors had done to Arcturus IV. ((Adventure into) Fear#24) - As the sun set on Arcturus, Lord I led Morbius to the last starship of their once mighty stellar fleet. As they approached, the barbarians condemned the mutant for his forbidden treading on sacred ground. I reminded the android barbarian that the mutants had built the ship and the androids as well, but the android condemned him as a blasphemer and ordered his troops to attack. With no other open path, Morbius urged Lord I towards the ship, but Lord I, lacking a self-preservation instinct, merely watched the approaching barbarians. Morbius pulled Lord I to safety and fought the barbarians, but, realizing there were too many to overcome, he sought to seize their queen as a hostage; however, Morbius was overcome by his bloodthirst and completely drained the woman. The barbarians briefly stared agape in horror before their leader again ordered them forward to slay him. Morbius ordered Lord I to open the ship's door as he held off the barbarians. Struggling to recall the means, Lord I soon opened the portal, but Morbius had to order Lord I through the portal, make room for him to follow, and to swiftly seal the hatch. The ship, designed to survive the rigors of space, kept the barbarians out. Lord I and Morbius scaled the ladder to the control complex, at which point Lord I encouraged Morbius to relax during their trans-galactic journey in preparation for their conflict with the Caretakers. As Lord I hit the ignition, most of the barbarians ran for cover, while the rest were reduced to ashes. ((Adventure into) Fear#24 - BTS) - En route to Earth, Morbius fatally drained Lord I's blood. ((Adventure into) Fear#24) - Several weeks after its departure, the Arcturan ship crashed on Earth. Blade (Eric Brooks) entered the ship and found Lord I's dead body. (Fantastic Four I#315 (fb)) - Fleeing the Cat People of the Land Within via their river, Master Pandemonium accessed the portal transmitting him to Arcturus IV. Encountering the mutants, Pandemonium realized he was on another world and found a message left behind by Morbius detailing his adventures there. Discovering a mutant apparently reading his thoughts, Pandemonium unleashed a demon to slay the mutant as punishment for violating his integrity. (Fantastic Four I#315 (fb) - BTS) - Realizing Master Pandemonium could kill them, as they desired, the mutants came to worship him. (Fantastic Four I#315) - The Fantastic Four (Crystalia Amaquelin, Human Torch/Johnny Storm, Ms. Marvel/Sharon Ventura, Thing/Ben Grimm) arrived on Arcturus IV via the warp within the waters surrounding the Land Within, and they fought against Pandemonium's demons. When one of the mutants (serpentine, with a snake's lower body) attacked the Thing and was swiftly overpowered, the rest of the mutates knelt before the Thing, realizing he could kill them, as they so desired. Pandemonium ceased the hostilities and convinced the Fantastic Four to unite with him in efforts to return home. Crystal, meanwhile, viewed the mutants, who she believed to be a result of genetic engineering, as cosmic brothers to the Inhumans, and she vowed to help them. Pandemonium brought the Fantastic Four to a series of tracks left behind by landing spacecrafts, and the Torch's investigations drew the attention of Comet Man and Max, who flew their comet ship there to confront them. Max, a Fortisquian, kicked a stone and activated a portal that brought Max, Comet Man, the Fantastic Four and Master Pandemonium to Earth's Savage Land. (Starmasters#1 (fb) - BTS) - Having mastered astronomy, the Arcturans were shocked at the unpredicted solar eclipse as the Axi-Tun's planet lock weapon sent an immense asteroid hurtling towards their planet. 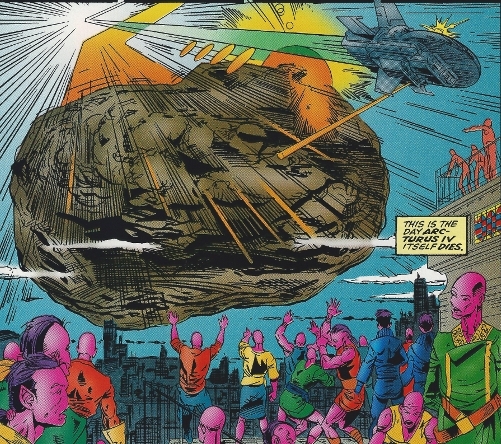 (Starmasters#1) - The immense asteroid tore a hole through Arcturus IV. The energy generated by the impact briefly outshined the sun Arcturus. Many died instantly, while others died after the atomic fires ignited the rest of the planet's atmosphere. The Axi-Tun Captain Ramrog reported Arcturus IV as "clean," purged of all its inferior life forms. Comments: Created by Steve Gerber, Craig Russell, and Vinnie Colletta. 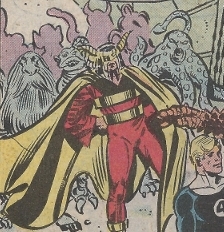 Up until Fantastic Four#316, there was no reason to think the Caretakers were not natives of Arcturus. 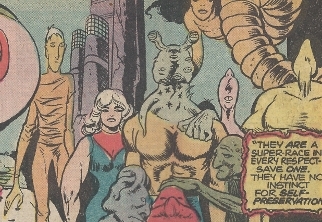 FF#316 revealed them to be Fortisquian (the same race as Max, who plioted "Halley's Comet" and empowered Stephen Beckley as Comet Man), but also confirmed that there were only a few Fortisquian colonizers on each world, and those on Arcturus left and later became the Caretakers. That may imply that the scientists who created the super-race were prot�g�s or something of the Fortisquian colonizers. Certainly there is no indication that the natives of Arcturus had no any idea that those who left were not native to their world. It is not known how swiftly the Beyonders responded to the Great Cataclysm, nor how long the Fortisquians' flight took, but there was indeed apparently a 10,000 year gap between the Cataclysm (18,000 BC) and the Fortisquians' ship crashing on Earth (8,000 BC). Lord I referenced Arcturus as "the name your race has given our sun" (Lord I was telepathic). Subsequent appearances, involving Fortisquians and Axi-Tuns have also had them calling the planet Arcturus IV. I've got no idea whether the natives called it anything else, or whether it was just "our world" and "our sun" to them? The appearance of the Arcturans in Starmasters#1, as a uniform race of pink-skinned semi-humanoids, is different than anything we've seen before. Their first appearance was a maximum of 5 years ago Marvel Time (20 years real time, but taking into account that Fantastic Four #1 from 1961 is a maximum of 13-15 years passage of time in the Marvel Universe) -- Arcturus was populated by barbarians (organic and androids) and mutants (who lived in the ruins of an ancient city). We saw the mutants again about 3 years ago Marvel Time (14 years ago real time), and they still seemed to be living in the ruins (though they had no instinct for survival or presumably for self-advancement). Starmasters#1 noted the Arcturans to have studied astronomy for millennia and to have possessed telescopes for five centuries. 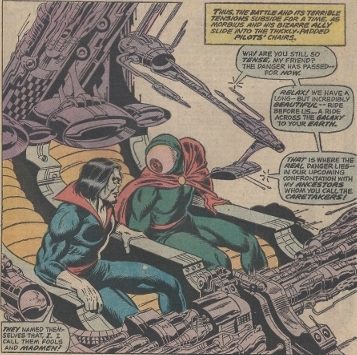 However, as seen in the Adventures into Fear and Fantastic Four stories, they had functional starships over 10,000 years ago, then descended into primitivism, which was their state when Morbius encountered them, 5 years ago or so. Perhaps the Arcturans seen in Starmasters#1 represented a group of "mutants" descended from a limited genetic pool, and this group reclaimed technology (at least astronomy) long before the other mutants and barbarians previously seen? There is little to nothing that occurred to the Arcturans in the Guardians timeline (Reality-691) that can be definitely considered part of Reality-616 (mainstream Marvel)'s history. The reality's diverged long ago, so events in one may or may not have happened in the other. I'd welcome a profile on Arcturus-691 if anyone wants to cover it. You can read much of the history of Arcturus-691's history in the Official Handbook of the Marvel Universe A to Z hardcover Vol. 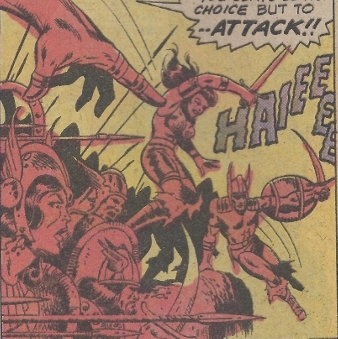 11: Starhawk entry, and Defenders: Strange Heroes' Aleta entry. Otherwise, it will probably be 2022 or later before I have the chance to get to it. You can check out some of it in the Reavers of Arcturus profile, though even that is probably incomplete. In Reality-691, the "normal" Arcturans eventually slaughtered the mutants. IIRC, it was also speculated in that reality that the mutates may have resulted from Arcturus IV's twins suns...I don't THINK that's the case in Reality-616. According to that site, this piece of history MAY or MAY NOT be common to realities -691 and -616. The androids were created by the flask-spawned super race. 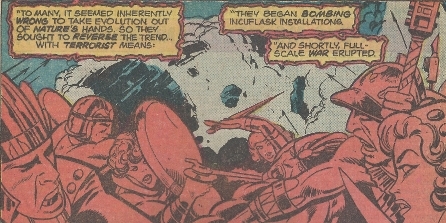 It is not spelled out, but one would assume that the flask-spawned race did this prior to the war that destroyed most technology and mutated the super-race into the race of mutants. Regardless, the androids dwelled amongst the organic normal/baseline Arcturans, with both groups living as apparently equal-status barbarians. There was even apparently romance between the android and organic barbarians (as you can see in the top right main image). The android to the right spoke for the group of barbarians worshipping the last starship as a god. When Lord I announced that his race had created both the ship and the androids, the android barbarian denounced him as a blasphemer and shouted for his people to attack. The androids appeared perfectly humanoid and there was no visible difference between android and living Arcturan (though Lord I could tell). There's no evidence the androids had any superhuman powers; when Morbius bit an android in the neck/jugular vein (the male in the top right main image), he drained a clear fluid (which he spat out and could not feed upon), and the android apparently perished from the assault. Morbius didn't realize his victim wasn't organic until he saw the bite wounds in the artificial skin; he noted the skin to be more like synthetic fiber. ((Adventure into) Fear#24 (fb) - BTS) - Arcturus IV was populated by a race of mutants and by tribes filled with a mix of android and human barbarians. ((Adventure into) Fear#23) - On Arcturus IV, Morbius ambushed a couple as they held each other in a relaxed embrace in a forest. The warrior male fought back fiercely, but Morbius overpowered him and attempted to drink his blood, but found his veins filled with a liquid unlike blood and soon found him an android. He subsequently fed on the organic female. ((Adventure into) Fear#24) - As Morbius and Lord I approached Arcturus' last starship, an android barbarian condemned the mutant for his forbidden treading on sacred ground. Lord I reminded the android barbarian that the mutants had built the ship and the androids as well, but the android condemned him as a blasphemer and ordered his troops to attack. Morbius fought and destroyed or slew several barbarians before escaping in the ship. As Lord I hit the ignition, most of the barbarians ran for cover, while the rest were reduced to ashes. (Starmasters#1) - The Axi-Tun's immense asteroid, directed by their planet lock device, tore a hole through the Arcturus IV. The energy generated by the impact briefly outshined the sun Arcturus. Many died instantly, while others died after the atomic fires ignited the rest of the planet's atmosphere. The Axi-Tun The Axi-Tun Captain Ramrog reported Arcturus IV as "clean," purged of all its inferior life forms. Following the devastating war, the normal/baseline Arcturans were cast into a primitive state. Under unrevealed circumstances, the androids created by the flask-spawned super-race apparently intermingled with the baseline Arcturans, dwelling as equals (and grossly indistinguishable from one another, with both groups living as apparently equal-status barbarians. There was even apparently romance between the android and organic barbarians (as you can see in the top right main image). ((Adventure into) Fear#23 (fb)) - Full-scale war erupted, destroyed most of society. Those who survived went mad, deserting the cities. They lived in tiny, primitive tribal enclaves. ((Adventure into) Fear#24 (fb) - BTS) - Arcturus IV was populated by a race of mutants and by tribes composed of a mixture of android and human barbarians. ((Adventure into) Fear#23) - On Arcturus IV, Morbius ambushed a couple as they held each other in a relaxed embrace in a forest. Morbius slew the android male in a futile attempt to drink his blood, then fed on the organic female, only draining enough of her blood as he needed for the moment. ((Adventure into) Fear#24) - As Morbius and Lord I approached Arcturus' last starship, they were confronted by and battled a group of barbarians for treading on sacred ground and for blasphemy (Lord I reminded them the mutants had built the ship and the androids as well). With no other open path, Morbius urged Lord I towards the ship, but I, lacking a self-preservation instinct, merely watched the approaching barbarians. 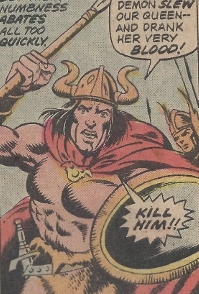 Morbius pulled Lord I to safety and fought the barbarians, slaying at least one of them. Realizing there were too many to overcome, he sought to seize their queen as a hostage; however, Morbius was overcome by his bloodthirst and completely drained the woman. The barbarians briefly stared agape in horror before a leader again ordered them forward to slay Morbius, who ordered Lord I to open the ship's door as he held off the barbarians. Struggling to recall the means, Lord I soon opened the portal, but Morbius had to order him through the portal, make room for him to follow, and to swiftly seal the hatch. The ship, designed to survive the rigors of space, kept the barbarians out. Lord I and Morbius scaled the ladder to the control complex, at which point Lord I encouraged Morbius to relax during their trans-galactic journey in preparation for their conflict with the Caretakers. As Lord I hit the ignition, most of the barbarians ran for cover, while the rest were reduced to ashes. (Starmasters#1) - The Axi-Tun's immense asteroid, directed by their planet lock device, tore a hole through the Arcturus IV. The energy generated by the impact briefly outshined the sun Arcturus. Many died instantly, while others died after the atomic fires ignited the rest of the planet's atmosphere. The Axi-Tun Captain Ramrog reported Arcturus IV as "clean," purged of all its inferior life forms. 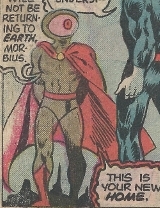 An organic/baseline Arcturan and the leader of a group of barbarians worshipping Arcturus' last ship, she was targeted by Morbius as a hostage to hold off the barbarian horde trying to slay him (and Lord I, who had "blasphemed" by noting how his race had created both the starship and the android race); however, Morbius was overcome by his bloodthirst and fatally drained her. The barbarians rushed forward to slay him, but he escaped aboard the ship with Lord I. Her corpse may have been consumed in the ship's exhaust. Potentate of a city of mutants, Lord I discovered the diagrams to the layouts of the last Arcturan ship within the city. He telepathically guided the approaching Morbius to their secret base. 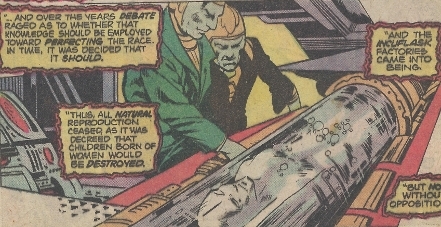 Revealing the Arcturans' history and the mutants' limitations, he asked Morbius to slay the Caretakers to prevent them from doing to Earth what had been done to Arcturus. Lord I guided Morbius to Arcturus' last starship and transported them to Earth, but Morbius fatally drained Lord I en route. As one of the flask-spawned super-race mutated by nuclear war, Lord I was virtually unaging, though he lacked any desire for self-preservation. Also lacking any vocal, breathing, or eating structures (or anything else in a face besides the eye), he spoke telepathically and had unspecified means allowing him to survive and function normally. He could recognize androids amongst the barbarian hordes, despite any obvious physical differences. ((Adventure into) Fear#23) - Lord I cast a mental projection to Morbius, introducing himself and guiding Morbius to the mutants' hidden base within the city's ruins. Revealing the Arcturans' history and explaining how the mutants, despite vast intellect and lifespans measured in centuries rather than years, had no instinct for self-preservation and actually desired death. Lord I asked Morbius to kill the Caretakers. 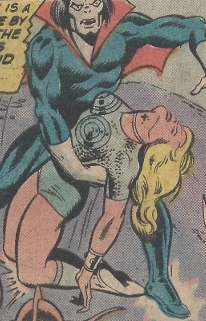 Overwhelmed by hunger, Morbius grabbed a mutant woman (who had flippers in place of hands) from their midst and fatally drained her of blood; when none of the Arcturans interfered (though Lord I shed a tear), Morbius realized he could not let the Caretakers do to Earth what their successors had done to Arcturus IV. ((Adventure into) Fear#24) - As the sun set on Arcturus, Lord I led Morbius to the last starship of their once mighty stellar fleet. As they approached, the barbarians condemned the mutant for his forbidden treading on sacred ground. Lord I reminded the android barbarian that the mutants had built the ship and the androids as well, but the android condemned him as a blasphemer and ordered his troops to attack. With no other open path, Morbius urged Lord I towards the ship, but Lord I, lacking a self-preservation instinct, merely watched the approaching barbarians. Morbius pulled Lord I to safety and fought the barbarians, but, realizing there were too many to overcome, he sought to seize their queen as a hostage; however, Morbius was overcome by his bloodthirst and completely drained the woman. The barbarians briefly stared agape in horror before their leader again ordered them forward to slay him. Morbius ordered Lord I to open the ship's door as he held off the barbarians. Struggling to recall the means, Lord I soon opened the portal, but Morbius had to order Lord I through the portal, make room for him to follow, and to swiftly seal the hatch. The ship, designed to survive the rigors of space, kept the barbarians out. Lord I and Morbius scaled the ladder to the control complex, at which point Lord I encouraged Morbius to relax during their trans-galactic journey in preparation for their conflict with the Caretakers. As Lord I hit the ignition, most of the barbarians ran for cover, while the rest were reduced to ashes. Morbius ordered Lord I to open the ship's door as he held off the barbarians. Struggling to recall the means, Lord I soon opened the portal, but Morbius had to order Lord I through the portal, make room for him to follow, and to swiftly seal the hatch. The ship, designed to survive the rigors of space, kept the barbarians out. Lord I and Morbius scaled the ladder to the control complex, at which point Lord I encouraged Morbius to relax during their trans-galactic journey in preparation for their conflict with the Caretakers. As Lord I hit the ignition, most of the barbarians ran for cover, while the rest were reduced to ashes. Lord I is the only mutant identified by name. 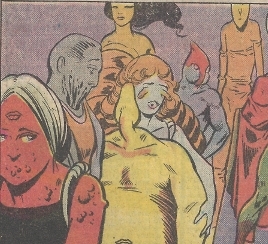 The yellow mutant with a flipper for a head and lacking arms (at least as of Fantastic Four#315), is one of the few recognizable characters seen in multiple images (and multiple issues) of the mutants. He had telepathic powers. When Master Pandemonium sensed his mind being read by the mutant, he slew the mutant, which led the other mutants, who just wanted to die, to worship him. 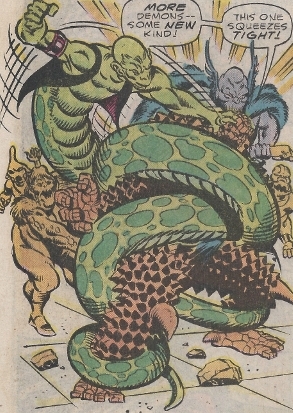 The serpentine mutant could powerfully constrict its coils, though not enough to seriously threaten the Thing at the height of his spikey-power. For the most part, we can only speculate on names and abilities of the other mutants. ((Adventure into) Fear#23 (fb) - BTS) - After the Fortisquian colonizers departed for Earth, debate raged as to whether science should be employed toward perfecting the race. ((Adventure into) Fear#23 (fb)) - In time, the Arcturans decided they should perfect their race via science, based on the work of the Fortisquian colonists later known as the Caretakers. The Incuflask factories came into being. It was decreed that children born of women would be destroyed, and all natural reproduction ceased. (Adventure into) Fear#23 (fb) / Fantastic Four I#316 (fb)) - To many Arcturans, it seemed inherently wrong to take evolution out of nature's hands. They thought to reverse the trend, with terrorist means. They began bombing Incuflask installations, and shortly thereafter, full-scale war erupted. The Arcturans' nuclear weaponry, vastly more efficient than Earth's nuclear devices, destroyed most of society. ((Adventure into) Fear#23 (fb)) - The flask-spawned super-race were mutated by radiation from the bombs, leaving them in markedly varying forms. The mutants were extremely long-lived, virtually unaging, but lacked the instinct for self-preservation. ((Adventure into) Fear#24 (fb) - BTS) - Arcturus IV was populated by a race of mutants and by tribes of android and organic barbarians (who were cast into a primitive state by the war). 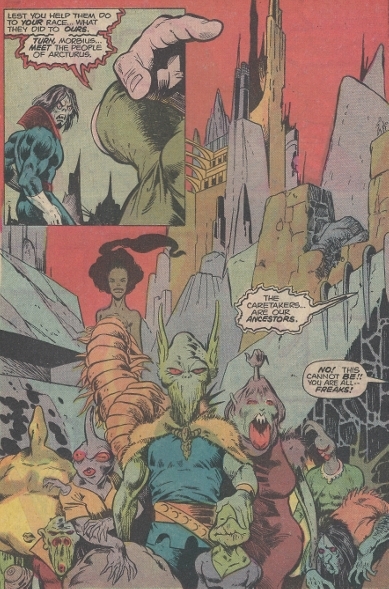 ((Adventure into) Fear#23) - As Michael Morbius approached the ruins of a city by dawn, Lord I cast a mental projection to Morbius, introducing himself and guiding Morbius to the mutants' hidden base within the city's ruins. Revealing the Arcturans' history and explaining how the mutants, despite vast intellect and lifespans measured in centuries rather than years, had no instinct for self-preservation and actually desired death. Lord I asked Morbius to kill the Caretakers. 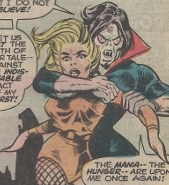 Overwhelmed by hunger, Morbius grabbed a mutant woman (who had flippers in place of hands) from their midst and fatally drained her of blood; when none of the Arcturans interfered (though Lord I shed a tear), Morbius realized he could not let the Caretakers do to Earth what their successors had done to Arcturus IV. ((Adventure into) Fear#24) - Lord I led Morbius to the last starship of their once mighty stellar fleet. As they approached, the barbarians condemned the mutant for his forbidden treading on sacred ground. Lord I reminded the android barbarian that the mutants (or at least the original flask-spawned super-race) had built the ship and the androids as well, but the android condemned him as a blasphemer and ordered his troops to attack. With no other open path, Morbius urged Lord I towards the ship, but Lord I, lacking a self-preservation instinct, merely watched the approaching barbarians. Morbius pulled Lord I to safety and fought the barbarians,then ordered Lord I to open the ship's door as he held off the barbarians. Struggling to recall the means, Lord I soon opened the portal, but Morbius had to order Lord I through the portal, make room for him to follow, and to swiftly seal the hatch. The ship, designed to survive the rigors of space, kept the barbarians out. Lord I and Morbius scaled the ladder to the control complex, at which point Lord I encouraged Morbius to relax during their trans-galactic journey in preparation for their conflict with the Caretakers. As Lord I hit the ignition, most of the barbarians ran for cover, while the rest were reduced to ashes. (Fantastic Four I#315) - The Fantastic Four (Crystalia Amaquelin, Human Torch/Johnny Storm, Ms. Marvel/Sharon Ventura, Thing/Ben Grimm) arrived on Arcturus IV via the warp within the waters surrounding the Land Within, and they fought against Pandemonium's demons. When one of the mutants (serpentine, with a snake's lower body) attacked the Thing and was swiftly overpowered, the rest of the mutates knelt before the Thing, realizing he could kill them, as they so desired. Pandemonium ceased the hostilities and convinced the Fantastic Four to unite with him in efforts to return home. Crystal, meanwhile, viewed the mutants, who she believed to be a result of genetic engineering, as cosmic brothers to the Inhumans, and she vowed to help them. Pandemonium brought the Fantastic Four to a series of tracks left behind by landing spacecrafts, and the Torch's investigations drew the attention of Comet Man and Max, who accessed a portal that brought Max, Comet Man, the Fantastic Four and Master Pandemonium to Earth's Savage Land. Type: Bilaterally symmetric humanoid bipeds. (Adventure into) Fear#23 (fb)) - After the Fortisquian colonizers departed for Earth, debate raged as to whether science should be employed toward perfecting the race. (Adventure into) Fear#23 (fb) / Fantastic Four I#316 (fb)) - To many Arcturans, it seemed inherently wrong to take evolution out of nature's hands. They thought to reverse the trend, with terrorist means. They began bombing Incuflask installations, and shortly thereafter, full-scale war erupted. The Arcturans' nuclear weaponry, vastly more efficient than Earth's nuclear devices, destroyed most of society. Those who survived went mad, deserting the cities. They lived in tiny, primitive tribal enclaves. ((Adventure into) Fear#24 (fb)) - The barbarians worshipped the remaining starships (or at least the last remaining starship) as god(s). ((Adventure into) Fear#23) - On Arcturus IV, Morbius ambushed a couple as they held each other in a relaxed embrace in a forest. The warrior male fought back fiercely, but Morbius overpowered him and attempted to drink his blood, only to find him an android. He questioned the female and then assaulted her instead, finding her an organic being and only draining enough of her blood as he needed for the moment. ((Adventure into) Fear#24) - As the sun set on Arcturus, Lord I led Morbius to the last starship of their once mighty stellar fleet. As they approached, the barbarians condemned the mutant for his forbidden treading on sacred ground. As the barbarians attacked, Morbius pulled Lord I to safety and fought the barbarians. Realizing there were too many to overcome, Morbius sought to seize their queen as a hostage; however, Morbius was overcome by his bloodthirst and completely drained the queen. The barbarians briefly stared agape in horror before their leader again ordered them forward to slay him. Lord I to opened the ship's door as Morbius held off the barbarians, then sealed the hatch once they were both inside. The ship, designed to survive the rigors of space, kept the barbarians out. As Lord I hit the ignition, most of the barbarians ran for cover, while the rest were reduced to ashes. I've always thought the "normal" image to the right was meant to represent a pre-mutation Stakar (the male component of Starhawk), who was later retconned into not even being Arcturan at all. (Adventure into) Fear#23 (fb) - BTS / Fantastic Four I#316 (fb) - BTS) - Arcturan civil war erupted. The Arcturans' nuclear weaponry, vastly more efficient than Earth's nuclear devices, destroyed most of society. Those who survived went mad, deserting the cities. They lived in tiny, primitive tribal enclaves. ((Adventure into) Fear#24) - As the sun set on Arcturus, Lord I led Morbius to the last starship of their once mighty stellar fleet. As they approached, the barbarians condemned the mutant for his forbidden treading on sacred ground. I reminded the android barbarian that the mutants had built the ship and the androids as well, but the android condemned him as a blasphemer and ordered his troops to attack. With no other open path, Morbius urged Lord I towards the ship, and Lord I opened the ship's door as as Morbius held off the barbarians. Struggling to recall the means, Lord I soon opened the portal, but Morbius had to order Lord I through the portal, make room for him to follow, and to swiftly seal the hatch. The ship, designed to survive the rigors of space, kept the barbarians out. Lord I and Morbius scaled the ladder to the control complex, at which point Lord I encouraged Morbius to relax during their trans-galactic journey in preparation for their conflict with the Caretakers. As Lord I hit the ignition, most of the barbarians ran for cover, while the rest were reduced to ashes.